Chia seeds are a great addition to many recipes. They contain the Omega-3 fatty acid, ALA, which is an essential fat. Therefore, it must be consumed in the diet. 1TBSP of chia seeds contain 3 grams of omega-3 fatty acids and 3 grams of protein! 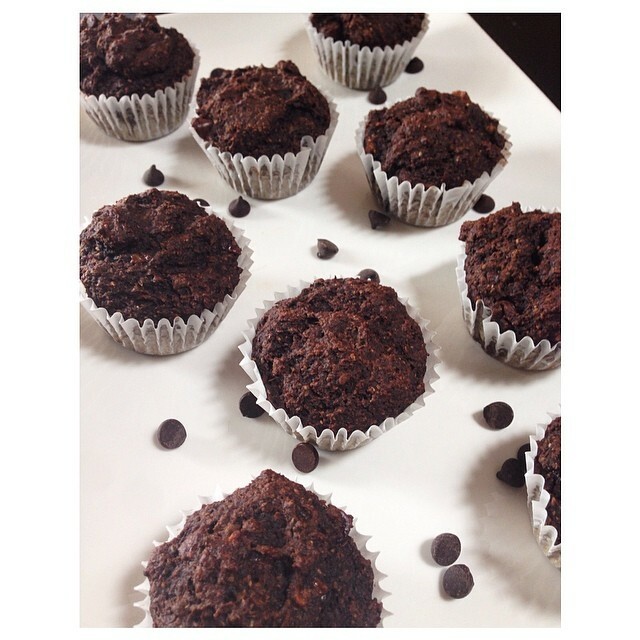 Additionally, I added ground flax and wheat germ for a nutrient boost in this muffin recipe! Ground flax is the most nutritious source of flax as it is easier to digest within the body and you will take away the most nutrients from this form! As I am sure you already know, flax is a great contributor to a healthy digestive system. It provides a wonderful source of dietary fibre which can help with bowel functioning! Also, just like the chia seed, flax contains a great source of the omega-3 fatty acid ALA too. Not only are these muffins packed with nutritional benefits but they are DELICIOUS. Stir in 1 tsp flax seeds and 2 tsp Chia seeds. Add dark chocolate chips (70% cacao is best) as you desire (I used ~1/3 cup). Bake at 350 for ~16-20 mins. Make sure they are done by poking with a tooth pick- when it comes out clean they’re done. PS- If you are looking to make this wheat/gluten-free, remove the 1/3 cup whole wheat flour and replace with either 1/3 cup flax meal or 1/3 cup almond flour. (Note: with almond flour/meal the shelf-life decreases and it may be beneficial to keep them in the fridge or freezer).